For more information see www.invisalign.com. Invisalign is one of the most advanced and modern alternatives to traditional train track braces. 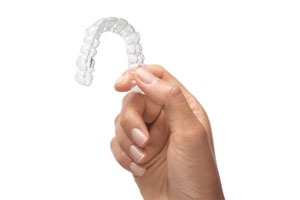 Invisalign uses a series of see-through gum shields (aligners) to straighten your teeth. These aligners need to be worn full-time, but, unlike traditional braces, can be removed for eating, cleaning your teeth, and for special occasions. Invisalign uses state-of-the-art CAT scanners, rapid prototyping and manufacturing techniques in addition to advanced computers to fabricate your aligners on prescription by Dr Mulgrew. Each aligner is slightly different, moving each tooth gradually into the desired position. You wear each aligner for approximately 1-2 weeks, before moving on to the next one. As you move through your aligners, your teeth continue to straighten until you get the smile you have always wanted. For more, read Dr Mulgrew’s answers to your FAQ here. You can learn even more about each phase of the procedure (from manufacturing aligners to wearing them) here. As for results – well, we don’t take photographs of our patients for no reason. Click here.